Request a consultation Let's talk! Let’s meet at Angajatori de Top! 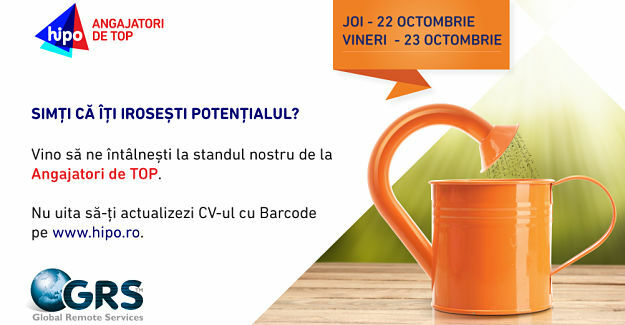 Global Remote Services will participate again at the biggest Romanian job fair for young professionals called “Angajatori de Top”. The fair is organized in Bucharest, Iasi and Timisoara and each edition brings together more than 160 companies. GRS will participate at the Bucharest edition of the fair, held at Sala Palatului on 22nd and 23rd of October. The company is looking to hire more than 20 persons who speak both French and Italian, at medium levels, for back office activities and customer support. This edition, GRS representatives will also look for those candidates speaking rarer languages like Arabic or Cantonese. Those interested can send their resumes in the meantime at recrutare@globalremoteservices.com. The candidates are not required to have previous working experience because GRS will provide training and coaching. GRS has a team of young and dynamic people and offers an attractive salary & benefits package. Friendly co-workers, nice offices near the subway or main means of transportation, constant trainings for your professional and individual development are just some of the keywords of your new possible career. Looking forward to meeting you at the fair! We would really like to help, so please tell us a little bit about your current challenges. We will be delighted to offer you an initial consultation free of charge and have consultants across Europe who can visit you.